Here is the interview with Chris Fulop, I hope you like it! What is your favorite thing about the TCG? I love the competitive outlet it provides. Why do most people enjoy playing sports? The competition. The opportunity to try and prove you are better than others. Everyone has their own competitive urge. Everyone wants to be able to try and prove they can excel at something. Pokémon provides a brilliant intellectual competition. It reminds me of a much more flavorful Chess. We’ve been provided with such a great player base, and such a rich environment for the Pokémon Franchise, that I’m addicted to not only the rush of the competition, but from the atmosphere provided at the events. I’m not going to say that the money that can be made at the game isn’t enticing as well. I love the ability to make money off of selling the cards I win, and the ability to earn scholarship through the events. I’m at a point in my life financially where I wouldn’t be capable of spending as much time on this game as I do if I didn’t have the ability to also make at least some money off of it. There are just so many reasons why this game is fun and compelling to me. It also keeps my mind fresh, sharp, and active. It is a great mental excersize. Plus, its simply fun. There are, of course, a few things I don’t like about the game. I feel that there is way too much luck involved in the game at the moment. The power creep in terms of card design has finally hit a point where it is dangerous for the game. The format is so quick that games are often decided by who goes first, or at the very least, by the outcome of the first turn. So many cards are so fast, and decks set up so fast that the number of games which are lopsided and over before they start is staggering. To make it worse, cards can’t just wind up “scaled back ” in terms of strength because no one would play them, and thus they would sell poorly, until the “good cards” rotated out of the format. Pokémon can’t afford the year or two worth of stagnation while they try to “fix” the format while the overpowered cards stay in. It provides a pretty difficult problem to fix. Of course prizes, coin flips, and the lack of mulligan options for unplayable hands is a pain too. Beyond that, I also get a bit aggravated by the apparent unwillingness to really embrace the fact that this game has a fantastic competitive side to it. So much more could be done in terms of Organized Play that I really feel isn’t being explored, and the blatant lack of interest in trying can be a bit demoralizing. None the less, every year improvements ARE being made, so I have some hope left that even these complaints will be worked through in time. Do you think the Pokémon TCG is more skilled or luck based? Did you have any mentor or someone who taught you how to play or did you learn on your own? I started playing when the game came out. I had been playing Magic the Gathering since 1995, and I’d been playing the Star Wars CCG for a year or two before it came out as well. My friend told me Pokémon was releasing a game, so having had a few years of experience in TCGs I snapped at the opportunity. I did most of my playing with my brother, who also had been playing since the same time as me. By playing a lot, and both of us being pretty good at cards, it really helped us both get better at a pretty rapid rate. Most of the best players had at least one person they were able to log plenty of games with while they got better, be it a mentor, or a partner of sorts. My brother wound up switching back over to Magic pretty quickly while I stayed with Pokémon. What was your favorite modified format to play in? People have argued that it added skill to the format? 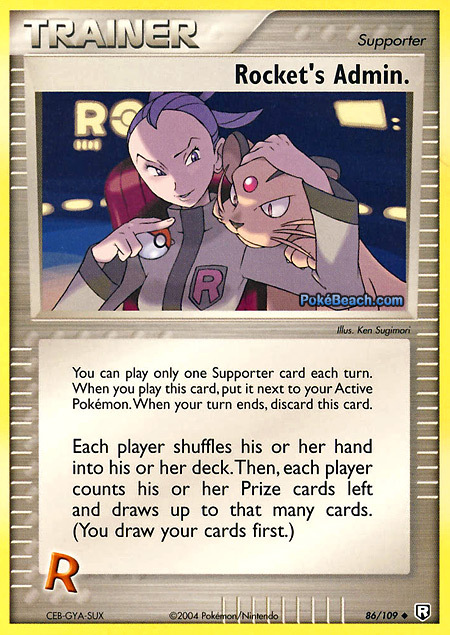 If by skill, you mean required you to somehow desperately hope that you can forge some sort of game plan to help increase your odds of surviving the inevitable baby Imposter Oak’s Revenge, Rocket Sneak Attack, Team Rocket’s Trap your opponent just played at you in one card. Yeah, sometimes you just have such an overwhelming board position it didn’t matter, but it turned every single close game into a luck fest. 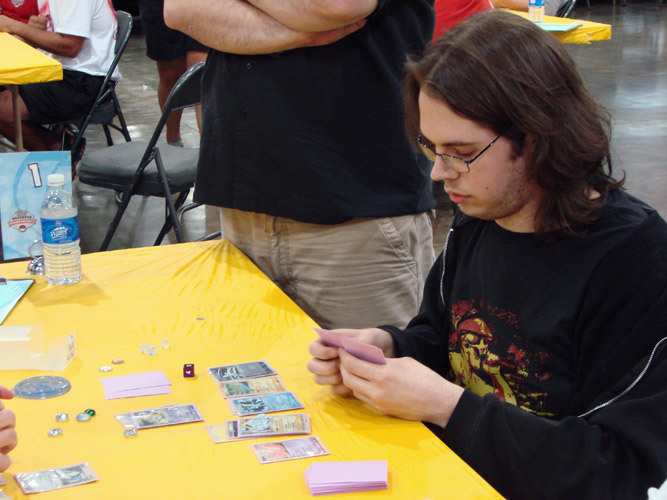 2007 was terrible due to gimped draw to the point that it hurt the format as a whole. You either ran Holon’s Castform or never had access to cards. The key to Speed Spread which swept the format wasn’t Jolteon EX, or Absol EX, it was Vaporeon EX. Decks had no answer to being given a 4 card hand midgame, when their entire game plan revolved around netting huge hands off of Delta Draw early. 2008 was good, but dominated by one ( and later two ) decks. 2009 might have been my favorite by default because I have the least sour grapes about it. In 2010 the true degeneracy of the power creep had set in full force. So my favorite Modified Format? None. I hate them all. I’m choosing Prop 15/3c to be a rebel. Do you have any special talents other than Pokémon? I’m a real charmer with the ladies. Hit me up on facebook girls ;) I play Bass as well, but that is less of a talent and more of a butchering of music. I draw, and I write as well. So in closing? Yeah, I was gifted with the ability to play cards and thats the peak of it. What is your favorite deck to play? Favorite deck right now? Kingdra Machamp or DialgaChomp. I’ve always had a soft spot for Kingdra. My favorite deck ever, on the other hand, is LBS. I felt I played the best I ever have in 2006 with that deck. I view that as the peak of my game. Hmmmm. What is my most memorable match? That is such a hard question to ask me. I could answer the first major event I made the finals of at the East Coast STS in 2001. I could say winning the Professor Championship in 2002. I could argue the finals game against Yamato in 2004 at Worlds. Maybe winning Nationals in 2007. I’m actually going to go with the finals match against Jason Klaczinski at Regionals 2006 in St. Louis. With myself and Jason being two of the most successful players in the game, it was the only time we met in the finals of a major tournament. I was using LBS against his Mewtric deck which he would later use to go on and win Worlds with. LBS was considered an underdog to Mewtric, which was geared to beating the popular stage 2 deck. I had adjusted the list to be able to beat Mewtric, beating a Mewtric in top 8 as well in 3 games. I ended up taking the match despite the difficult matchup and top notch opponent. Do you play any other TCG or CCG besides Pokémon? I play Magic the Gathering at the moment as well. I’ve played so many different game sin the past. I always have TCG ADD. I want to keep trying new ones out in addition to Pokémon. I’ve played Magic, Star Wars, BattleTech, NetRunner, SpellFire, Magi Nation, the Spoils, Dragonball Z, C23, WCW Nitro, WWF Raw Deal, the VS System, Lord of the Rings, Legend of the Five Rings, Harry Potter, Ultimate Combat, and others. In 2 years, do you still plan to be playing the Pokémon TCG? In 2 years I don’t plan to be playing. I will still be involved in the game, but I’d like to have moved on from being an active player. I’d rather be judging, or even organizing tournaments. Fulop explains things a lot more then other people have who have been interviewed. And he seems to have a great viewpoint on the game. Lol prop 15, now that takes me back. I didn’t like it much as a kid–I felt like whoever hit the first Oak was able to take off and get the clear advantage. Still, you can’t blame wizards for trying an alternate format. I kindof liked the 2002 format post sneasel/sloking bans, but that really didn’t last long at all. Good eye, thanks for posting that. Hahaha “the Spoils” that game is the biggest flop ever. I was a tournament organizer and everything. I have the staff beta stamped cards and all that. but it was nice to go to a draft tournament with only like 5 other people and win $125. Oh wow. I traded some cards with Fulop over in Akron the other day. I was then told afterwards how successful he was in the Pokemon TCG, and then I now find out he is a writer for my favorite Pokemon site!